I asked a client this question a few months ago. The thing is, this particular leader isn’t alone. From the conversations we’re having with clients every day, we’re hearing the same sense of unease. And we’re seeing so much organisational effort being thrown at the problem of growth. We know the world of our customers, shoppers, consumers, patients is changing fast. So fast it’s daunting. We also know that unfortunately, many businesses are simply not set up to respond well in this dynamic environment. At best, organisations are merely coping with change rather than getting ahead of it and leading to growth. Traditional organisational structures, siloed ways of working and allocating resources, ‘classically’ skilled employees and prevailing leadership practices. None of these are set up to stay ahead of the needs of people buying our products and services. However, what we see working with companies in this situation, is that when we probe deeper, they usually have all the ingredients they need to grow – strong trade partnerships, brand assets, good people, healthy levels of distribution, etc. In our experience, it’s rarely about creating more initiatives. We’re seeing growth comes when companies simplify and connect what they do internally – sorting out the tangled roots and focusing on what their organisation does when at its best. Be brave and confront the truths about your current business reality. Identify what’s limiting your growth. Are you pragmatic about the market you operate in? Do you truly understand your competitors? Do you really know what excites your customers and trade partners? Do you know what doesn’t? Be realistic. Consider the world outside in. Then single-mindedly align the wholebusiness behind the few things that need to change to drive growth. Ensure these chosen growth drivers are clear and explicit to all. Understand where you make money, now and against your future growth drivers. Are your trade investments supporting your growth objectives? Do you have a consistent approach to pricing and promotions across key markets and segments? Quantify any gaps in performance and create plans to address inconsistencies in revenue policies. Then equip your people with the skills and knowledge to implement the changes and build propositions which help your trade partners to grow. Create a seamless experience for the people who buy your products and services: dismantle the departmental silos which carve up the customer journey into artificial chunks. Start with small and informal cross-functional teams focused on delivering a great experience on a specific customer journey. Then execute, review and adapt – keep what’s working well, and change what isn’t. Clearly document what you have learnt each time you evolve. That’ll help you create commercial teams focused on giving customers a consistently great experience. It’s business all right, but not ‘as usual’. Over the next two months, the OxfordSM team and I will be digging deeper on some of these themes and sharing how to make an impact in reality. 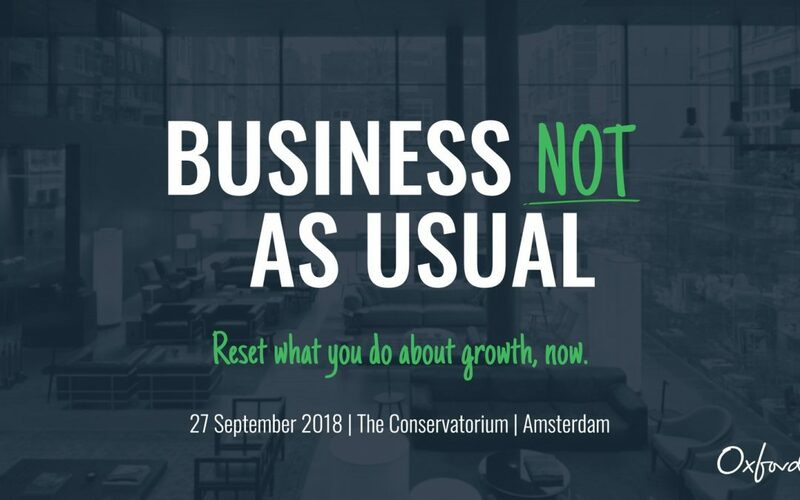 On 27th September in Amsterdam, we’re bringing together business leaders from around the world, to share their experiences and what they’re doing to address some of the issues we’ve raised here. If you recognise any of the themes above and are looking for ideas on how to tackle them, we still have a few places available.